The following article originally appeared in the July 9, 2009 edition of the Tooele Transcript Bulletin. Ever since I moved to Stansbury Park, I’ve joked that my neighborhood was built atop a ghost town. Last summer, a crew installing a water line in Stansbury Park accidentally lent some credibility to that claim. On July 22, 2008, a sub-contractor for the Stansbury Park Improvement District was digging along Stansbury Parkway when their equipment chipped the corner of a reddish brick about four feet beneath the pavement. SPID manager Brett Palmer contacted the staff of the historic Benson Grist Mill, who determined that the exposed brickwork was part of a building foundation. Preliminary analysis suggested the foundation belonged to the long disappeared miller’s residence, a significant structure to the histories of Richville and E.T. City. “So is that why things sometimes move by themselves in our house?” asked my 7 year old son, Bridger, when I told him about the find. Not wanting to kill the Goosebumps-fueled fantasy that was rapidly formulating in his head, I refrained from telling him that if our house is haunted, it’s by the ghosts of the turkeys who were raised on the land it now sits on—not by specters of gun-slinging cowboys. For me, the discovery of the foundation underscored the fact that the patchwork quilt that is Tooele County history is far from complete, and that the past—in many ways—is often closer to us than we realize. Last spring I received an email from a recent transplant to Tooele County from out of state. He expressed a deep interest in the history of the region and asked me to give him ideas for history-related outdoor adventures. I suggested he start in the area of the grist mill. Settlement of the north end of Tooele Valley radiated from the mill, which was built in 1854 by LDS apostle Ezra Taft Benson. Benson’s Mill produced wheat and corn by the ton, becoming a major contributor to the County’s economy. Its influence was so great that the mill and its immediate vicinity, dubbed “Richville,” served as the Tooele county seat for six years. The large area between the mill and Black Rock was known as E.T. City. The sprawling collection of farms and settlements that would later become Lake Point is still home to some of the era’s most intact and interesting relics. Richville dissolved and E.T. City evolved into Lake Point long ago, but an amazing number of vestiges of these pioneer communities remain intact and surprisingly visible to those who care to look. Taking a tour of these relics doesn’t involve any grand hikes or long treks, but it’s a rewarding endeavor nonetheless. A journey westward into Tooele County in the mid to late 1870’s offered quite a different experience when compared to the present. Whereas cars speed past the northern point of the Oquirrhs today with nary a second thought, yesterday’s slow stagecoach ride along Utah’s second territorial road allowed the curious traveler ample time to take in his surroundings. The Great Salt Lake was much higher then, and Utahns were drawn to its shores in droves. Lakeside bathing resorts were a promising enterprise then, and travelers to Tooele were greeted by bustling oases at Black Rock, Garfield, and Clinton Beaches. A long pier connected the latter to an elegant hotel in what would become Lake Point. Anchored at its dock or cruising along the shore was the “City of Corinne,” a Mississippi River-type steamboat that boasted two stacks and three decks. Originally built to haul ore between Corinne and Lake Point, the stern-wheeler quickly found more practical use as an excursion vessel. The boat was a regular site along the shore. It was particularly striking at night, when it was vibrant with strings of lights and the sounds of its on-board orchestra. E.T. City’s main drag was along present Sunset Road in Lake Point. Along this road are the old LDS Chapel and schoolhouse. The chapel was built in 1884 using stone gathered from the area. It was home, according to some accounts, to the oldest ward in the LDS Church, and was used for meetings until 1986. The intact building stands at 2000 E. Sunset Road. It’s currently owned by local telecom company Wireless Beehive. The nearby schoolhouse, owned by the same company, was built in 1894. 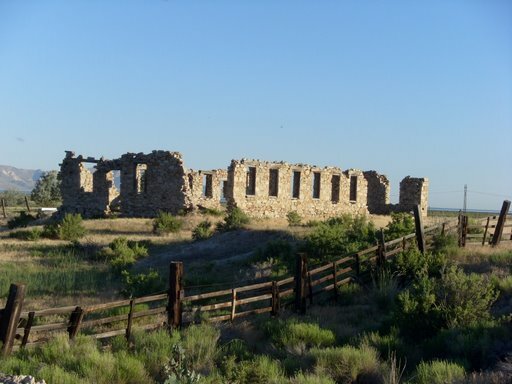 The Kennecott-owned ranch west of Adobe Rock on SR-36 is home to several historic structures. Most notable are the picturesque remains of the Grantsville Woolen Mill. The mill was dedicated in 1870, but was closed shortly thereafter due to dam failure and stability issues caused by quicksand. It later served as a fishery, and a dairy before being abandoned. The remains are easily viewed from SR-36. More historic structures stand near and at the grist mill, including the Lee Tannery and Summerhays Wool Pullery next to the mill site. Several historic buildings have been restored and moved to the site as well. Two original houses near the site are still occupied, including one built by Joseph Young, brother to Brigham Young. The most spectacular building is the grist mill itself, thanks to a committee of volunteers who began to restore it in 1983. Abandoned and in disrepair since the 1940’s, the committee restored the mill– plank by plank– to its current state. The mill is hailed as the most significant structural landmark between Salt Lake City and Reno. It’s open to the public from May through October, and free tours are offered on a regular basis. Last summer’s encounter with the miller’s residence foundation came as more of a surprise to the team installing the water pipe than it did to grist mill staff, who already suspected it was near that spot. But this resurfacing of the past proves to modern-day explorers that there’s still plenty of history still out there to discover. For more information on the history of northern Tooele Valley, visit www.bensonmill.org. A pamphlet detailing a self-guided driving tour of E.T. City is available at the gift shop for $1. Please respect all private property. Many thanks to Colleen Garrard and the staff at the Benson Grist Mill for their input on this article. I live at 52 lakeview in the 1970’s – 1980’s era section of Stansbury Park on the Lake. I love it but when you said that there were older settlements that have long since dissapeared I couldn’t help but wonder what may have existed in our area… anything? Thanks for stopping by, Kelly! I don’t know if there was anything where your house now stands, but to the northeast of you were farms– mostly turkey farms. Experts believe that the Hastings Cutoff ran right along what is now Stansbury Parkway, so you’re not far from some significant history.